On Thursday, we headed to the West End to watch Scooby-Doo Live at the London Palladium. In this brand new family musical SCOOBY-DOO and the MYSTERY INC. gang have been called upon to help solve an epic mystery. A trouble-making ghost is haunting a West End theatre, the London Palladium (ooh! ), and DAPHNE (Charlie Bull), FRED (Chris Warner Drake), SHAGGY (Charlie Haskins), VELMA (Rebecca Withers) and SCOOBY-DOO (Joe Goldie) are on their way, and bringing the MYSTERY MACHINE to crack this spooky, theatrical case. Along the way the MYSTERY INC. gang meet the Theatre Manager, Walt Warner (John McManus) and Box Office Manager, Muriel Martin (Kate England), both of whom seem to know more than they are prepared to let on. All the while local Stagehand, Wilbur (Martin Neely) seems very interested in the mysterious theatre ghost wreaking havoc with SCOOBY-DOO and his friends. Maybe this time the gang are in over their heads?! We are all (longtime in my case!) fans of Scooby-Doo so looked forward to the show and also wondered how this much loved cartoon would be transformed to the stage. Our thoughts were soon answered, the characters are dressed just like their cartoon versions and stay perfectly in character throughout the show and during the cast meet and greet. They have flawless accents, expressions and even mannerisms. 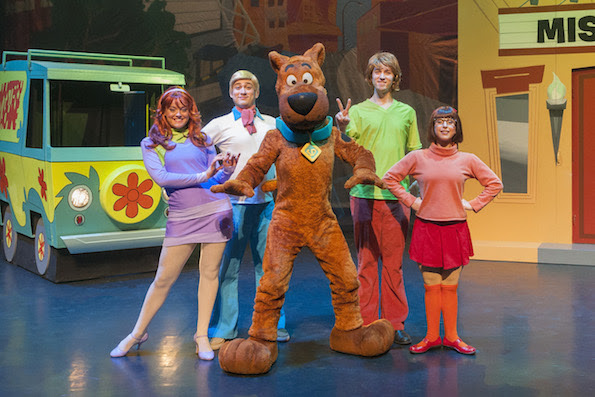 I love how the retro cartoon style of the original Scooby-Doo is preserved within the stage designs, fonts, costumes and even the action- such as the cartoon running style dance featured in the songs. Many familiar scenes, such as Scooby-Doo jumping into Shaggy’s arms are recreated and this adds to the nostalgia of the show- along with seeing the Infamous Mystery Machine and Scooby Snacks of course! Talking of the songs, SCOOBY-DOO LIVE! MUSICAL MYSTERIES features big musical numbers including the evergreen Scooby-Doo theme song, “Scooby-Doo, Where Are You?” alongside fun and catchy new songs including “We’re Mystery Inc.,” “Round Every Corner” and “A Musical Mystery.” The audience are encouraged to join in with the dancing by shaking our arms, clapping our arms and strumming our guitars. I think more could be made of this as at times the audience needed a bit more encouragement to join in. One thing that I love about Scooby-Doo stories is how despite the ghosts, ghoulies and monsters, they always manage to be be more fun than scary. At the beginning of the show the kids were warned to look after their grown ups during the scary parts and my four year old took this role very seriously- putting her hands over my eyes and cuddling me each time “the ghost” appeared. The show is just 80 minutes long (including a 20 minute break) so makes a great “first West End Show” to take younger kids to. My four year old loved it and wants to see it “again, again and again”. She is still taking about meeting “the real people” from Scooby-Doo. My 7 and 9 year old enjoyed watching it and joining in. I appreciated the nod to one of my favourite musicals, Phantom of the Opera and had a really fun afternoon watching this with the kids. After the show it was time for the meet and greet. To book the meet and greet tickets, click on Discounts on the page after selecting your seats (Meet and Greet customers should make their way to the Val Parnell Bar after the performance). This was very well organised and the kids were looked after- they were taken safely onto the stage and great care was made to make sure the smaller kids could see. The kids loved joining in with the dances on stage and were really excited when the star of the show, Scooby-Doo came out. Daphne was great with all the kids too and won them all over. It was lovely to see them asking her questions to which she would reply in her friendly manner with her customary hair flick or back leg kick. 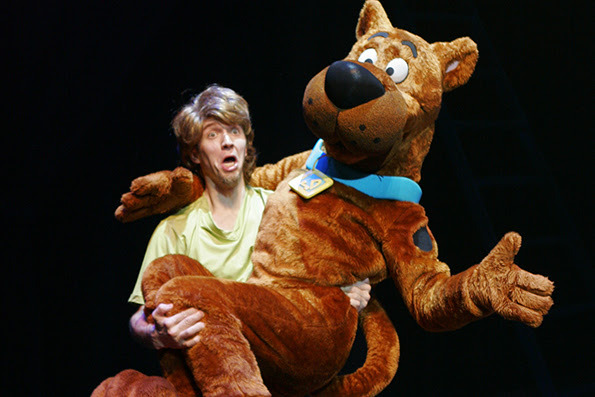 Scooby-Doo Live Magical Mysteries is on for one more day only at the London Palladium so book your tickets now and look out for more Life Like Touring UK dates in the future. We were provided with tickets for the purpose of this promotion. All views are honest and our own.